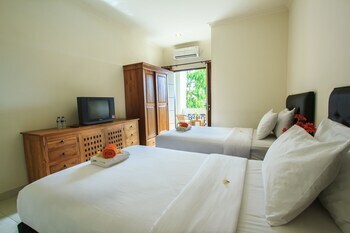 With a stay at Ivanka Airport Inn in Tuban, you'll be within a 10-minute drive of Kuta Beach and Tuban Beach. Featured amenities include a computer station, a 24-hour front desk, and luggage storage. A roundtrip airport shuttle is provided for a surcharge (available 24 hours), and free self parking is available onsite. With a stay at Airy Gasibu Aria Jipang 6 Bandung in Bandung (Bandung Wetan), you'll be a 5-minute walk from Perpustakaan Gasibu and 8 minutes by foot from Gedung Sate.